A range of identifying information can be added to any digital image including keywords to help locate the desired image on your computer along with the copyright status and website url. If you are creating images for the web you might want to read my Optimizing Images PS Tutorial as a supplement to this tutorial. 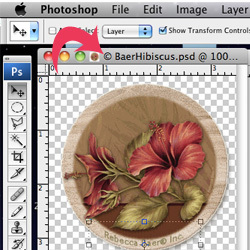 Begin by creating a new or opening an existing image file. I am starting with an existing file. Take a look at the current file name. 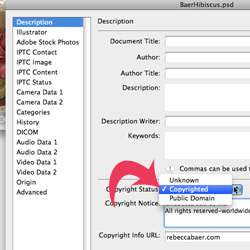 This is the way it appears before I have added and information or defined the copyright status [Fig. 1]. 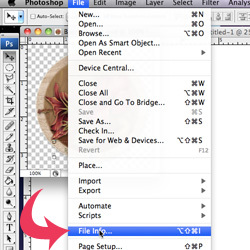 At the top of your screen select file>file info from the drop-down menu [Fig. 2]. This action results in a pop-up screen with several fields [Fig. 3]. You can title the document, identify the author, insert a description and add keywords. To change the copyright status select the drop-down menu. It is set at "unknown" by default. Then choose copyrighted or public domain. Just below the drop-down menu there is a field where you can enter text defining specific limitations or permissions. Further down there is a field where you can enter your URL. When you have entered the information for the image click "OK". Take a look at the file name for the image. 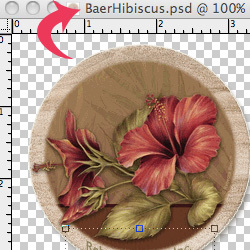 Notice that the copyright symbol now appears before the file name [Fig. 4].